→ 1996-97 Topps Chrome is a 220-card set and released exclusively via retail, which means production and availability was limited. Packs carried a $2.99 SRP and came with 4 cards. Refractors were inserted at a rate of 1:12. Aside from card #72, to denote their status, all refractors have an "R" next to the card number. The Kobe Bryant is the most notable card in the set. → 1997-98 Metal Universe Precious Metal Gems are serial numbered to 100 and parallel the 123-card base set. Serial numbers 1-10 are the Emerald PMGs while serial numbers 11-100 are the Red PMGs. That said, Emeralds carry a print run of 10 copies while Reds carry a print run of 90 copies. 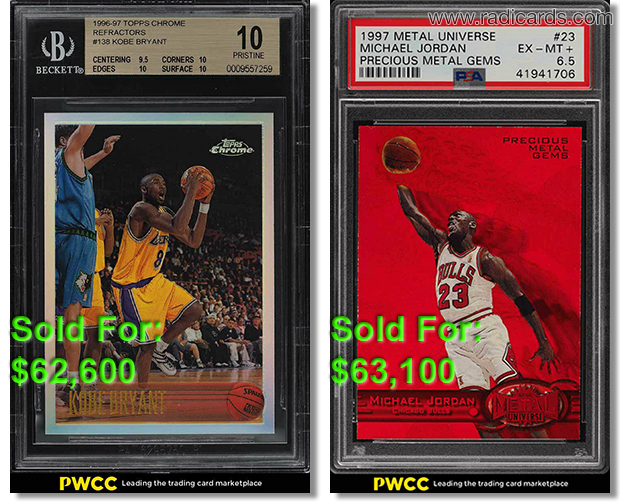 The Michael Jordan, in any version, is the most valuable card of them all. Have something to share? Post your thoughts in the comments area.